This is a a great oil painting accessory for artist or painter to wash painting brushes and place brushes. 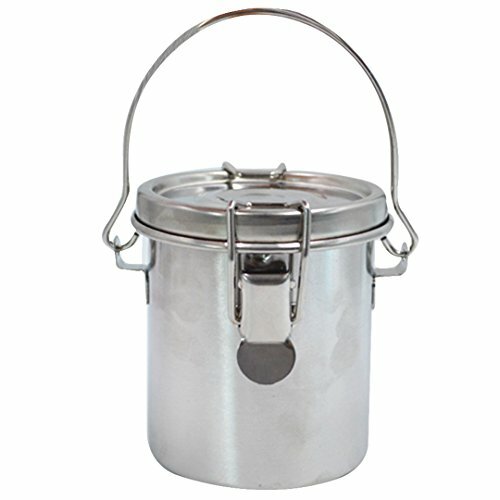 It is made of stainless steel so the container will not rust or leak. Compact size that portable to carry around. A convenient handle makes carrying quick and easy. The brush washer features a filter screen in cleaning chamber that allows paint sediment from your brushes to fall to the bottom of the outer pot. The lid has a built-in rubber gasket that forms an air tight, leak proof seal, preventing the smells and harsh fumes of solvents from escaping, and keeping solvents from spilling out while traveling. This brush washer can be used for water, turpentine, mineral spirits, and other solvents. Please allow slight size deviation due to manual measurement. If you are satisfied with our service and product, you kindly 5 stars positive feedback will be highly appreciated. Hope you have a pleasant shopping experience. Thank you very much! Material: high quality stainless steel and rubber material, rustproof, anti-corrosion, sturdy and durable. Dimension: 3.3 * 3.5 in / 8.5 * 9 cm (Length * Height), Compact size, but enough space to hold 10oz of solvent. Leak proof lid has a thick rubber gasket to prevent leaks, good sealing performance, and effectively prevent the turpentine volatile. Removable filter provides a surface to clean bristles against and allows the paint to settle below and leaving clean solvent in the top. Versatile, stainless steel construction means the brush washer can be used for water, turpentine, mineral spirits, and other solvents. convenience to carry anywhere to use. View More In Brush & Pen Cleaners. If you have any questions about this product by Kennedy, contact us by completing and submitting the form below. If you are looking for a specif part number, please include it with your message.